Int Ch Shavian Hey Presto gained his 31. CACIB. He was also BOB & BIG2!!!! The breed judge was Mr Rui Goncalves from Portugal. Shavian No Mercy won the junior class (20 entries) and can now hold the title Nordic Junior Winner-05. My sincere thanks goes to co-owner Anita Härkönen, kennel Boogie’s who handled her perfectly and has keep her in the great condition, thank you ! 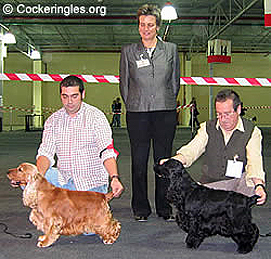 The Finnish Spaniel Club’s The Cocker Of The Year 2005 Int Ch XXL Of Black Mirage. We did it again !!! Int Ch Shavian Hey Presto CACIB, BOB, BIG1 !!! The breed judge was Ms Sue Kettle from the UK. Int Ch Shavian Hey Presto BOB, BIG2. The breed judge was Mr Hans Müller from Switzerland. Int Ch Shavian Cosa Nostra CC, CACIB, BOB & BIG1 !!!! Waterwood The Diplomat BOB- & BIS2-veteran. The breed judge was Dr. Tamás Jakkel from Hungary. Int Ch XXL Of Black Mirage was BOB. The breed judge was Mr Laurent Pichard. Int Ch XXL Of Black Mirage BOB, BIG & BIS3. Fashion Show Of Black Mirage res.CC. Ch. Shavian Raindrop, owner Minna Myllyniemi, was BOS. The breed judge was Mr Diogo Ramalho from Portugal. My sincere thanks goes to Mr Vesa Lehtonen who kindly handled Elton in the final rings. Shavian Hey Presto CC, CACIB, BOB, BIG 2. The breed judge was Dr. Tamás Jakkel from Hungary. Congratulations Hey & Antonio !!!! Fenbrook That’s My Girl gained her 4th CC and was BOS. The breed judge was Mrs Arja Koskelo. Congratulations Taava & Eva. Int Ch XXL Of Black Mirage cacib & BOB. The breed judge was Mr Harri Lehkonen from Finland. Shavian Dancing Wheels open class 1st price 46 points (50 max). Congratulations Nessi & Elina, very well done ! Int Ch. XXL Of Black Mirage BOS. Ch. Waterwood The Diplomat 2nd Best Male & BOB-veteran. The breed judge was Mr Fernando Madeira Rodrigues from Portugal. Shavian Dancing Wheels open class 1st price 46 points (50 max). Congratulations Nessi & Elina, very well done !! The breed judge was Mrs Eva Mjelde from Norway. Breeze Black Petrs 2 x CC, 2 x CACIB, BOB, BIG3. Shavian Dancing Wheels was qualified in the field. Congratulations Nessi & Elina !! Almost 9 years old Waterwood The Diplomat CC, CACIB & BOB. That was Steve’s 3rd CC from Latvia and now he can hold the title Lv CH. The judge was Mr Rune Fagerström. My sincere thanks goes to Mari, who kindly took Steve with her to Latvia. Int Ch XXL of Black Mirage BOB, BIG & BIS ! Fashion Show of Black Mirage 2nd best dog & CC. The judge was Mrs Paula Rekiranta. The judge was Niels Brandstrup from Norway. Well done Emma & Minna ! Shavian Golden Rule was qualified in the field and can now hold the title FIN CH. Congratulations Hugo & Maarit !!! Fashion Show Of Black Mirage was also qualified in the field. Ch. XXL Of Black Mirage BOB & BIG4. Shavian Soul Mate CC & BOS. The breed judge was Mrs Kirsti Louhi. Shavian Hey Presto gained CC, BOB & BIG2. The breed judge was Sr José Manuel Sastre. XXL Of Black Mirage was BOS. Fashion Show Of Black Mirage got his 2nd CC. The breed judge was Ann Long-Doyle. Ch. XXL Of Black Mirage gained CC & BOB. 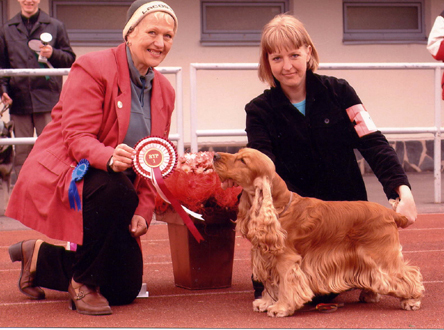 The breed judge was Lilian Jonsson. Ch. XXL Of Black Mirage cacib, BOS. The breed judge was Marija Kavcic. Fashion Show Of Black Mirage 3rd best male with res.CC. The breed judge was Mrs Paula Heikkinen-Lehkonen. Shavian Golden Rule, owner. Maarit Flinck, CC, BOB, BIG !!!! The breed judge was Mrs Rita Kadike-Skadina from Latvia. Congratulations Maarit & Hugo !!! I am so proud of you. Int Ch XXL Of Black Mirage was BOB, BIG & BIS. Fashion Show Of Black Mirage in his first show 2nd best male with CC. The breed judge was Annaliisa Heikkinen. The breed judge was Susie Svoldgaard. Ch. XXL Of Black Mirage BOB & BIG3. The judge was Dr. Tamás Jakkel from Hungary. Ch. Shavian Hey Presto CC, BOB, BIG, BIS3. The judge was Mr Dan Ericsson from Sweden. FCI confirmed today INTERNATIONAL CHAMPION TITLE for SHAVIAN HEY PRESTO. XXL of Black Mirage was BOS, getting also CC & Cacib. The breed judge was Mr Nils Molin from Sweden. Received some great news from Hungary. Int Ch. 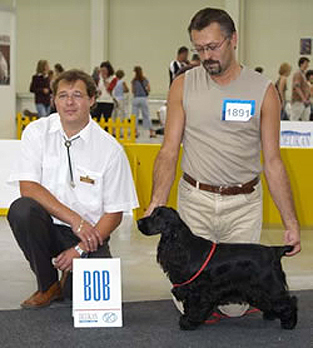 XXL Of Black Mirage is “Cocker of The Year 2004” and “Spaniel of The Year 2004” in Hungary. His son Int. Ch. El Nino Of Black Mirage is Runner up in Cocker of The Year competition. FCI confirmed today THE INTERNATIONAL CHAMPION TITLE for Francini’s Encanto Latino. Shavian Golden Rule 2nd Best Dog with CC & res-cacib. The breed judge was Mr Rajko Rotner,Slovenia. The group judge was Ms Annaliisa Heikkinen, Finland.